You are invited to celebrate God’s faithfulness to Denver Presbytery and Peoples Presbyterian Church. The Reverend Evan Amo will be installed as the new Pastor of Peoples Presbyterian Church on Sunday, April 28, 2019 at 2:00 pm. The Reverend Kira Anderson (Wellshire PC) will bring the message. Rev. Andy Hamer (Shepherd of the Hills PC), Moderator Wanda Beaumann (Peoples PC), Elder Sharon Cochran (Peoples PC), Rev. Chris Spotts (FP Brighton), and Rev. Louise Westfall (Central PC) from our Presbytery will participant in the service as Evan's commission. This special service provides an opportunity to witness how the whole Presbyterian Church (USA) functions as the Body of Christ to support member congregations. Come and celebrate this milestone in the life of Peoples Presbyterian Church! A reception will follow the service. Join Clayton Cobb, your Regional Church Consultant from the Board of Pensions, for a lunch gathering for Pastors, Church Administrators, Personnel and Finance Leaders and Benefits Decision Makers. Besides a better understanding of the benefits plan, all will take away suggestions and solutions for churches and employers of all sizes – small and large – to be the best employers they can be. This event is open to all who wish to attend, please forward this notice to all who might be interested. Register no later than Friday, April 26th so we can order lunch. Box Lunches or sandwiches will be ordered. Please indicate your dietary needs. 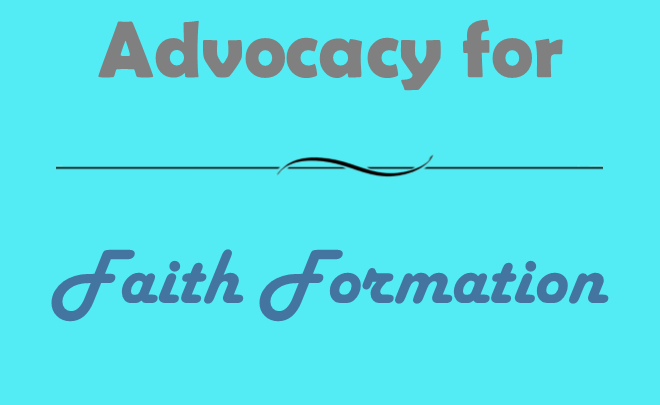 Faith Formation Advocacy Partnership Gatherings for 2019 are open to everyone engaged in Faith Formation Ministry for any and all ages. You are invited and welcome to join us for any of our Monthly Gatherings and to invite others to join us as well. Pre-Registration is closed. Registration begins at 4:30 p.m. Tuesday, March 26th at Genesis Presbyterian Church. The frozen chosen are trying something new! At our March Assembly Meeting we will begin at 5:30 pm. The meeting will begin with a Call to Order and Prayer. Following the prayer we will share a meal together with intentional conversations. After a time of fellowship we will be lead by Genesis in music, continuing us in worship and our Assembly Meeting. The Assembly Workgroup is trying something new. The intention is to bring more meaning and connection during our time together. Handicapped Facilities: Available, contact Beth Carlisle with questions. Childcare: Available if requested prior to Wednesday, March 20th, contact Beth Carlisle. Announcements: Send to Beth Carlisle no later than March 18th, these will be displayed on the screen prior to the meeting. Display Tables: Available if requested, contact Beth Carlisle no later than, Friday, March 15th. Sunday, February 24 2019 at 3:00 p.m.
You are invited to celebrate God’s faithfulness to Denver Presbytery and Church of the Hills. The Reverend Susan P. Boucher will be installed as the new Pastor of Church of the Hills in Evergreen, on Sunday, February 24th, 2019 at 3:00 pm. This special service provides an opportunity to witness how the whole Presbyterian Church (USA) functions as the Body of Christ to support member congregations. The Installation service will be led by those that have supported Denver Presbytery, Church of the Hills and Susan throughout the years. Following the service, The Board of Deacons will hold a reception. If you plan to attend the reception then please RSVP to jnnsnyder9@gmail.com or call 303-670-3496 by Sunday, February 17, 2019. Please indicate your preference of baked salmon, glazed ham, or prime rib. Our first Pre-Event Gathering is Coming Up! We will gather together the Youth and Adults that will be participating in this summer’s Presbyterian Youth Triennium - July 16 – July 20, 2019 at Purdue University in West Lafayette, Indiana. The day will be filled with Triennium overview, activities, more Triennium information and a chance to get to know the rest of the Delegation from Denver Presbytery. Topic: After Christmas, our congregation spent service all together and looked at the Nativity story through the lens of art / artists. We'd love to share that service with all of you and explore opportunities we've already taken to make intergenerational ministry happen! As Christian educators, we keep advocating for this idea of ministry shift so what are we actually doing to make it a reality, both success and failures alike. 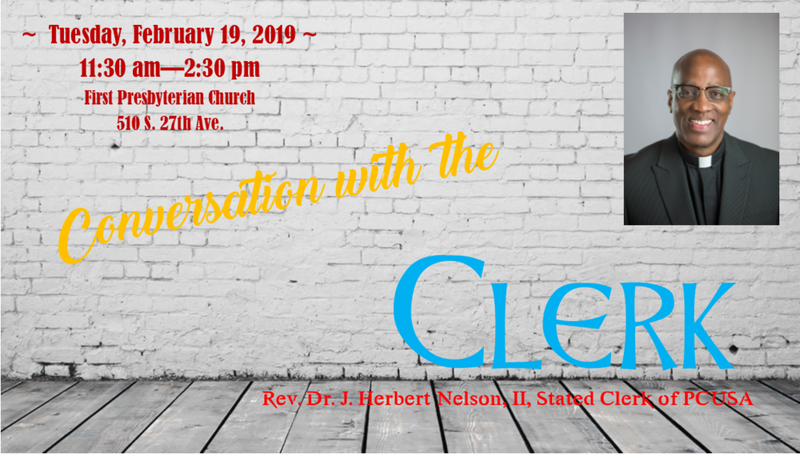 The Stated Clerk of the General Assembly, J. Herbert Nelson, II, is holding a series of regional listening sessions throughout the denomination for the purpose of hearing what’s on the minds of our churches. Accompanied by Deputy Stated Clerk, Kerry Rice and Associate Director for Mid Council Relations, Tricia Dykers Koenig, he will be in the Denver area on February 19th for a gathering hosted by the Presbytery of Denver. You are invited to First Presbyterian of Brighton, 510 S. 27th Ave., Brighton, CO, from 11:30 am until 2:30 pm. This is an open meeting, please encourage your members to attend and share in this opportunity to talk about whatever is on their minds with denominational leaders. Lunch reservations have closed. Please come with your thoughts and questions! Sunday, February 10, 2019 at 2:30 p.m.
You are invited to participate in the installation of the Reverend Dr. Christopher Spotts as the new Pastor of First Presbyterian Church of Brighton on Sunday, February 10th, 2019 at 2:30 pm in the sanctuary. His father, the Reverend Dr. Dwight Spotts of Spokane, Washington will bring the message. Several other leaders from our Presbytery will officiate. This special service provides an opportunity to witness how the whole Presbyterian Church (USA) functions as the Body of Christ to support member congregations. Come and celebrate this milestone in the life of First Presbyterian Church of Brighton! Refreshments following. Pre-Registration is closed. Please come to the meeting and check in at the registration table. Please sign-in at the registration table upon arriving and pick up your Ballot. In an era when many people believe churches to be irrelevant, there is a way for congregations (of any size) to make a difference: Community organizing. Come and learn about a model of mission in which churches work together with schools, unions and other non-profits to build relational power and create sustainable change in their community. By building relationships between institutions, by identifying and researching issues of importance to the community, and by organizing for action, churches are leading change in the communities they serve. Come hear how our congregations in Arvada are experimenting with community organizing as mission. Led by Jorge Montiel of IAF (Industrial Areas Foundation), Rev. gretchen Sausville and Rev. John Anderson. Wheat Ridge Presbyterian Church will host a dinner. Tickets for the dinner will be $8 available at registrations. A mixed green salad, Penne Pasta Bar with Marinara Sauce and optional meatballs for the main course. A seasonal fruit cobbler with ice cream will be available for dessert. 2018 Book of Proposed Amendments available, click here. Denver Presbytery will vote on these proposed amendments at the January 22, 2019 meeting. The Association of Stated Clerks Analysis is available, click here. Learn more. Questions, email: Stated Clerk Olivia Hudson Smith. The location of our January Assembly meeting has a ramp for access to the sanctuary level where the pre-assembly, business meeting and worship will be held. Dinner will be in the fellowship hall. It is located on another level; to access without the use of stairs, outside entrance through another door would be necessary. We apologize for the inconvenience. If you would like to share events happening in your congregation, please contact Beth Carlisle. We have a limited space at the January meeting. Unfortunately we have no space for display tables. The presbytery will accept childcare RSVPs until one week prior to each meeting. If there are no registrations at that time, childcare will not be available. Contact: Beth Carlisle. Host churches will do their best to accommodate requests for gluten-free, dairy-free & vegetarian meals. Requests must be made in advance to: Beth Carlisle. Let us observe the Martin Luther King Jr. Day together in conversation and worship! We'd love to know how many people to expect. Please check all that you plan to attend. We will see you on Monday, January 21, 2019! Click here for bulletin insert. This webinar will offer congregations and pastors alike a way to address the challenging topic of privilege and social divisions with generosity, humility and hope. This webinar will be particularly useful in the context of predominantly white congregations with members who want to explore the concept of privilege and consider whether a loving response is possible. Recognize what privilege is and how it functions in our culture. Be able to identify the ways social divisions harm vulnerable people through the injustices of exclusion as well as the ways social divisions harm the very people they supposedly benefit . Understand Jesus’ approach to social divisions and apply a model of healing to our broken world. Omaha Presbyterian Seminary Foundation is offering 50% scholarships for the first 20 registrants. Email a copy of your paid registration to opsf@opsf-omaha.org and OPSF will reimburse you $15 of your webinar fee. On-demand video replay allows you to watch the video recording on the Outlook‘s website whenever it is convenient for you and as many times as is helpful. Questions, contact Stated Clerk, Olivia Hudson Smith. At the October Assembly in the Omnibus motion, a link to the Proposed Amendments to the Constitution (Proposed Amendments to the Book of Order) indicating that the Assembly will be voting on those amendments in the January and March 2019. January Assembly: 18-B.1, 18-B.2 Renunciation of Jurisdiction; 18-G. Disciplinary Offense; 18 – H.1, 18-H.2 Time Limit. March Assembly: 18-A – Election of Ruling Elders and Deacons; 18-C – Officers; 18-D Membership of Presbytery; 18-E – Pastor, Counselor, and Adviser; 18-F. Welcoming to the Table. Click here for pdf of proposed amendments. Click here for pdf of Stated Clerks’ Analysis. Please join us as we gather for a communion service lead by our new Transitional Presbytery Pastor, Rev. Dana Hughes, followed by a luncheon. 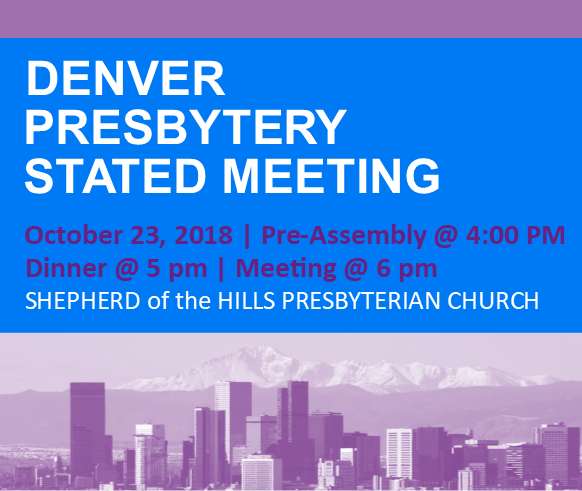 Please RSVP by November 23rd to Denver Presbytery with your check or register and pay on-line by clicking image to the right. $15 per person. Please indicate meat or vegetarian meal. TO RSVP and pay on-line, use desktop device. From the drop down menu, select number of attendees and add to cart, a form will pop up to indicate name, guest and choice of entree. After submit form, click on orange “cart” icon that will be at top right-hand corner of screen. Transaction is complete when enter credit card information. Please hold your colleague, Carrie Doehring, and her family in your prayers upon the death of her husband, George Magnuson. Carrie is a minister member of Denver Presbytery and professor at Iliff School of Theology. George suffered a brain injury Thursday and died a few hours later with Carrie at his side. Cards may be sent to Carrie Doehring at 2310 South University Boulevard, Denver, 80210. Please do not call at this time. A funeral service for the Rev. George Magnuson will be held on Saturday, December 1st, 2018 at 1 pm at St Andrew's Episcopal Church, 2015 Glenarm Place. In lieu of flowers, donations may be made to The Friends of Music of St Andrews Episcopal Church, 2015 Glenarm Place, Denver, CO 80205. A memorial service will also be held in Chicago: Date to be determined. May Carrie and the family be comforted in God's loving grace by our prayers and support in their loss. FEATURING • Rev. Jana Childers, PH.D., Dean of San Francisco Seminary, Vice President for Academic Affairs, Professor of Homiletics & Speech Communication. TOPICS INCLUDE: Agape as Unifier Holy Spirit to go between us & bind us together Practices we do in and beyond worship to be open to people with different points of view. Plus: Worship Wiki Why we do what we do in worship & what are some different ways to do it. Telling My Story with Dr. Christine Mann Darden, NASA Scientist. Dr. Mann Darden is one of the human computers featured in the book “Hidden Figures”, Darden will talk about her life journey and the lessons to be learned from the movie. Open to family and friends! RSVP to Vicky Terry by email or call 720.273.6870, no later than 10/10/18. The Advocacy and Faith Formation Community will host Sources of Strength at Grace Presbyterian Church. A Presbytery-wide training for multiple congregations across the Presbytery. Dan Adams, Director of Training for Sources of Strength, will lead us in two days of training on the importance of mental health and wellness promotion in communities of faith, through strength-based community storytelling and individual/community resiliency practices. Youth leaders, faith leaders, parents, youth (5-12 grades) and community members are invited to come to this training prepared to learn about and experience how you can use your voice to spread Hope, Help and Strength with youth and adults across your community. The conference begins on Monday, September 24, 2018 at 2 PM. Check-in/registration will begin at noon. The conference concludes on Wednesday, September 26, 2018 at noon. For a more detailed schedule, please click here. The Second Wind Walk/Run event is returning to Green Mountain this year! The Walk/Run has been going 17 years strong to raise funds to save the lives of youth at risk of suicide. Join other Coloradans on Saturday, September 15, 2018 to walk, to run, to heal, to remember, or to celebrate life.There will be a a short program, entertainment, and a memorial dove release, followed by a 5K fun run and/or a 1 mile or 5K walk. This event also includes games, activities, music and a picnic lunch. All proceeds benefit Second Wind Fund to help pay for life-saving therapy for youth at risk of suicide in Colorado. Fees include a free t-shirt, for those who sign up early. Our Workdays are a great time for your family, your youth group, your congregation to join us for a morning of projects around camp. All ages are invited to join us as we serve as stewards of this beautiful place! We are becoming a more and more diverse nation. By 2023, it is estimated that 50% of U.S. children will be ethnic minorities. By 2042, 50% of U.S. population will be ethnic minorities. (And this is due to birth rates, not immigration.) As this nation becomes more diverse, it is more important, now than ever, to engage in thoughtful conversation on issues concerning race and diversity. So, let’s have conversation! *This is first of several regional events to come. The main audience for this event are members of churches in the NW part of Denver (W of I-25 and N of Hwy 6). Bring a dish to share. We will be watching a video presentation and engage in thoughtful and provocative conversation about race and diversity. See you on Friday, September 14th at North Highland Presbyterian Church! 8:30 a.m. Registration Opens – Pre-Register, click here. Please sign-in at the registration table upon arriving. A sack lunch will be available for purchase to eat before you go or take with you. On-line Pre-Registration is now closed. Please come to the meeting and check in at the church. Please join our partners, Shoulder to Shoulder, on August 9th at 1:00pm EST for a "Faith Over Fear" Webinar on Messaging: Addressing Myths and Misperceptions about Muslims in your congregations and communities. This webinar will be the first of a “Faith Over Fear” Webinar Series. This first webinar, Messaging: Addressing Myths and Misperceptions about Muslims will be facilitated by Shoulder to Shoulder and partners, Guthrie Graves-Fitzsimmons with ReThink Media, Aneelah Afzali with The American Muslim Empowerment Network at the Muslim Association of Puget Sound, Arsalan Bukhari with the Council of American Islamic Relations and Rev. Terry Kyllo from Neighbors in Faith on Thursday, August 9 at 1 pm ET/10 am PT. Registration is now open for the 2018 Churchwide Gathering. Whether you register by mail or on line, remember that when you register for the Gathering, you can also register for your synod meal, buy a tote bag (embellished by refugee women trained through Kentucky Refugee Ministries’ STITCH program) and buy meals for a guest. Register by May 1 and you’ll receive a special-edition Gathering pin. And the first 800 registrants will receive a copy of Bound Together in Love: The Creation of Presbyterian Women, 1978–1988 (appropriate reading in anticipation of PW’s 30th anniversary!). Seeking financial assistance for the Gathering? A limited number of leadership development grants are available to help with Gathering costs. These reimbursable grants will cover up to $500 in Gathering registration, housing or travel expenses. The deadline for applying has been extended to May 1, 2018, but early application is encouraged. First-time Gathering attendees will receive priority consideration.